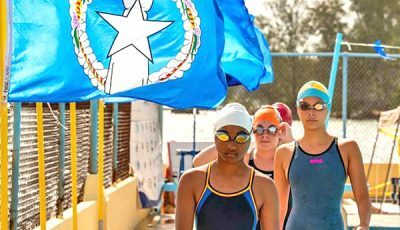 The CNMI has only one month to decide whether to host the 2021 Pacific Mini Games or not. Pacific Games Council president Vidhya Lakhan and chief executive officer Andrew Minogue met with Gov. Ralph DLG Torres and Lt. Gov. Arnold I. Palacios last Monday and yesterday to present and discuss proposals that aim to keep the Mini Games on Saipan. Under the PGC recommendations, the Games will be scaled down from 12 events to six and the budget will be decreased from $8 million to around $3 million. The CNMI government through Northern Marianas Sports Association then has to get back to PGC next month and make a final decision about Saipan’s hosting of the Games. The clock is ticking for the CNMI, as the PGC will hold a general assembly in Samoa in July and announce whether the Commonwealth is moving forward with the hosting or a new bidding should be opened. “I wish to personally thank Gov. 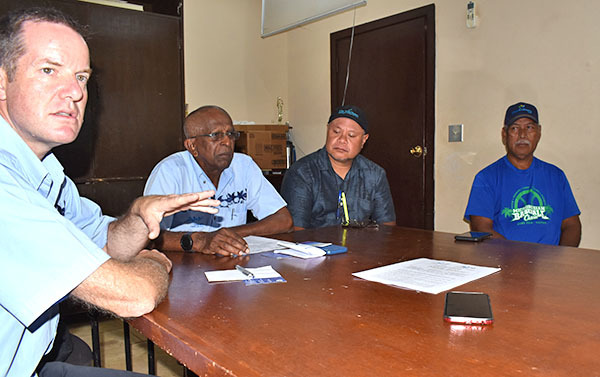 Torres for meeting with the PGC and listening to our proposals to keep the 2021 Pacific Mini Games on Saipan where they rightfully belong,” Lakhan said. “The PGC is more than prepared to make compromise to our program to significantly reduce costs and alleviate the financial pressures on the administration as recognition of the need to consider the devastating impact of Super Typhoon Yutu,” the PGC president added. Minogue declined to name the six sports they proposed, but said that the Games operations will be consolidated within the Oleai Sports Complex and Marianas High School to minimize logistics and financial requirements. He also said that they suggested revenue initiatives that will help cover the costs of the Games and lessen the financial obligations of the CNMI government, which last month withdrew its commitment to Saipan’s hosting of the quadrennial event to focus its resources on the continued recovery efforts from the Category 5 storm. From the around $3-million budget suggested by PGC, part of it will come from fees from the participating countries, which will pay $450 per delegate to the host. Others could be from sponsorships from the private sector. Minogue declined to elaborate on other revenue measures they suggested. While PGC deeply understands that the CNMI’s focus is on the continued recovery on Saipan and Tinian, Minogue said the islands should not be discouraged from hosting the Games. “Don’t be too despondent. We are prepared to reduce our ‘standards’ to make the Games affordable,” Minogue said. Majority of the facilities on Saipan sustained massive damage from Yutu, but Minogue said that they are in better shape than the venues in Vanuatu, which also suffered destructions from a strong storm two years before it hosted the 2017 Mini Games. “At least half of the sports could be held now if they had to be and so we believe that these Games remain affordable and capable of being successfully delivered in the CNMI. I invite the governor to take this opportunity to remain in partnership with PGC and NMSA,” said Lakhan, as he seconded Minogue’s observations. Press secretary Kevin Bautista acknowledged receipt of the PGC proposals and said the CNMI government will carefully review them. “Gov. Torres and Lt. Gov. 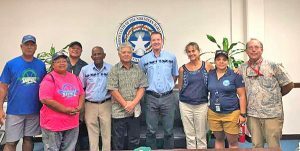 Palacios had productive meetings over the last two days with the Pacific Games Council and NMSA to discuss the feasibility of the CNMI’s ability to host the Games. We’re taking their proposal under advisement and will discuss further in order to come up with a final decision,” Bautista said. “The PGC was receptive to our current challenges, and we look to come to a resolution within the month. Right now, our priority will be on taking care of our most vulnerable residents in the tents, our students in the temporary classrooms, and our businesses facing the economic hardships following Super Typhoon Yutu,” he added.